Army Radio reports Paraguay and Honduras are ready to relocate their embassies to Jerusalem if Netanyahu visits their countries. Paraguay and Honduras said they are both ready “in principle” to relocate their embassies to Jerusalem, Army Radio reported on Sunday, citing a senior Israeli diplomatic source. According to the report, the two countries conditioned the move on Prime Minister Binyamin Netanyahu making an official visit to their country. In December, the UN General Assembly overwhelmingly voted to condemn U.S. President Donald Trump’s recognition of Jerusalem as Israel's capital, with a total of 128 of the UN's 193 members voting in favor of the resolution. Honduras was one of eight countries to have voted with the U.S. against the motion, the others being Guatemala, Israel, the Marshall Islands, Micronesia, Nauru, Palau and Togo. The United States ambassador to the United Nations, Nikki Haley, recently visited Honduras and praised President Juan Orlando Hernandez for backing the U.S. decision to move its embassy to Jerusalem. Paraguay abstained in the UN vote but has in the past expressed pro-Israeli sentiments. In September, Netanyahu was on a state visit to Latin America. 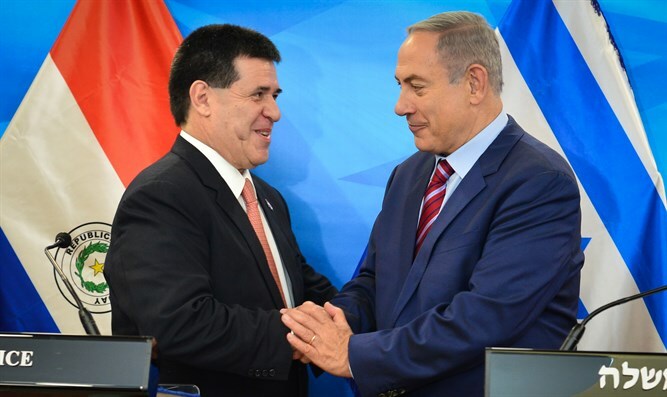 While he did not make a stop in Paraguay, Paraguayan President Horacio Cartes came to Buenos Aires specifically in order to meet Netanyahu. If either Honduras or Paraguay indeed move their embassies to Jerusalem, they would be following in the footsteps of Guatemala, whose President Jimmy Morales told the AIPAC Policy Conference in Washington a week ago that Guatemala's mission would be moved "two days after the United States moves its embassy" to Jerusalem on May 14. Another leader who has expressed a desire to move his country’s embassy to Jerusalem is Czech President Milos Zeman. Last week local media reported that Zeman would like to speed up the process of moving his country’s embassy to Jerusalem but has been met with objections from the local foreign ministry.